Your host Lorelle Sunderland is the youngest great-grand-daughter of Scottish Pioneer James Anderson, who at 27 emigrated from Scotland in 1848 and originally bought 13 acres of land at Ceres, nine kilometres from Geelong, Victoria. 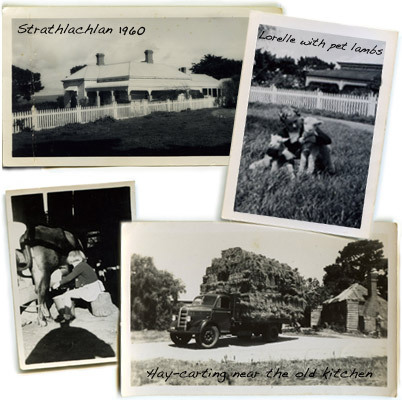 During forty hard-working years, he eventually added 'Strathlachlan', Barrabool, to his extensive holdings. Portions of this land have remained in the Anderson family through descendants, William and Douglas, for seven successive generations – now over 150 years, since Charles McLachlan sub-divided the Strathlachlan Estate for Scottish Immigrants. The 'Old Kitchen' featured in the photograph was utilised by James Anderson's parents and his siblings, when he brought them to Australia by boat from Perthshire, Scotland. The building was demolished in the 1970s but some of the clinker chimney bricks have been used to pave the veranda at Barrabool Hills Retreat. Barrabool derived its name from the Indigenous tribe which roamed the hills before European settlement. CLICK for information on our family Coat of Arms.